Cardiac arrest, irrespective of its etiology, has a high mortality. This event is often associated with brain anoxia which frequently causes severe neurological damage and persistent vegetative state. Only one out of every six patients survives to discharge following in-hospital cardiac arrest, whereas only 2-9% of patients who experience out of hospital cardiac arrest survive to go home. Functional outcomes of survival are variable, but poor quality survival is common, with only 3-7% able to return to their previous level of functioning. Therapeutic hypothermia is an important tool for the treatment of post-anoxic coma after cardiopulmonary resuscitation. It has been shown to reduce mortality and has improved neurological outcomes after cardiac arrest. Nevertheless, hypothermia is underused in critical care units. This manuscript aims to review the mechanism of hypothermia in cardiac arrest survivors and to propose a simple protocol, feasible to be implemented in any critical care unit. After the recovery of spontaneous circulation, cerebral blood flow initially attains supernormal levels but falls to below normal over a period of several hours. , This reduced cerebral perfusion pressure is a consequence of cerebral vasospasm which occurs due to endothelin release. Leukocyte clumping and microvascular coagulation further reduces the cerebral blood flow. Increased cerebral oxygen requirements during the low-flow phase further result in secondary ischemia. Case series have reported the feasibility of using TH after ROSC in the setting of cardiogenic shock and TH in combination with emergent percutaneous coronary intervention (PCI). ,,,,,,, Case series also report successful use of fibrinolytic therapy for acute myocardial infarction (AMI) after ROSC, but data are lacking about interactions between fibrinolytics and hypothermia in this population. 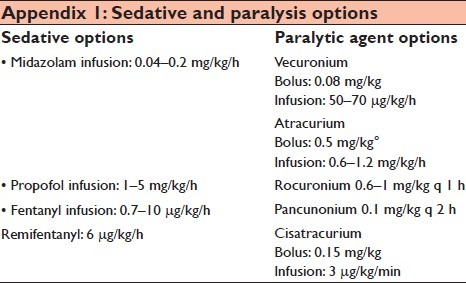 ,, The eligibility criteria for therapeutic hypothermia are given in [Table 1]. The best time to initiate hypothermia after cardiac arrest is not completely understood till date. It is logical to conclude that the benefits may be maximized if hypothermia is initiated as soon as possible after successful resuscitation. Experimental studies of cardiac arrest in animal models have shown that the beneficial effect of hypothermia was lost when hypothermia was delayed for more than 1 h after ROSC. ,, Beyond the initial minutes of ROSC and when hypothermia is prolonged (>12 h), the relationship between the onset of hypothermia and the resulting neuroprotection is less clear. , HACA group has shown that the interval between successful resuscitation and achieving the required temperatures has an interquartile range (IQR) 4-16 h with a mean of 8 h and has demonstrated better outcomes in hypothermia-treated patients than in normothermia-treated patients. A case series consisting of 49 consecutive comatose cardiac arrest patients cooled intravascularly after pre-hospital cardiac arrest has also shown that time of target temperature (mean 6.8 h) (IQR 4.5-9.2 h) was not an independent predictor of neurological outcome as previously thought. Another registry based case series of 986 comatose post-cardiac arrest patients suggested that time to initiation of cooling (IQR 1-1.8 h) and time to achieving target temperature (IQR 3-6.7 h) were not associated with improved neurological outcome after discharge. Five studies have indicated that the combination of TH and PCI is feasible and safe after cardiac arrest caused by acute myocardial infarction. The hypothermia comprises of three phases-induction, maintenance, and rewarming. 1. The ideal cooling method is one that is able to induce rapid hypothermia, without overcooling risk; to keep the desired temperature without wide variations, to provide a controlled and slow rewarming; to be minimally invasive and affordable. Cooling may be invasive or non-invasively induced. The non-invasive or conventional methods include use of ice packs, thermal blankets, surface cooling devices, and infusion of cold solutions. These methods are quite effective to induce hypothermia; however, the rate of temperature change is less accurate and there is a higher overcooling risk, in addition to a more difficult rewarming. Combinations of these methods have been used in several TH studies, showing good results. Infusion of cold fluids at a 30-40 mL/kg dose, either peripheral or centrally, is capable of inducing a temperature drop by 2°C-4°C, with the advantage of practical use even in pre-hospital setting. , Large cold saline volumes do not appear to be associated with severe adverse effects in cardiac arrest survivors, with no pulmonary edema seen in these patients. Along with the use of cold saline, using ice packs over the neck, axilla, and groin surfaces is a simple and easy way to keep cooling. The external ice packs should be changed when melted, and attention should be paid to cold-induced skin injuries. No association is obvious between the body surface and the time to hypothermia induction. Ice packs together with thermal blankets are the most inexpensive way to induce TH; however, studies have shown that overcooling is almost a rule, with potential severe complications if very deep or prolonged. Overcooling is uncommon with surface cooling devices. These devices are made of pads covered with thermal gel, connected to a thermoregulator unit. The system either increases or reduces the circulating water temperature in response to both the target temperature and the patient's temperature. The mean elapsed time to reach the target temperature is about 1.4°C/h. This is a safe and effective method, as the temperature range is better controlled both during induction and rewarming. Cooling methods are given in [Table 2] (2a- Internal cooling and 2b-external cooling). The temperature should be regularly measured, aiming to be kept between 32°C and 34°C over 24 h.  An important point for these patients' care involves hemodynamic parameters. Mean blood pressure levels above 80 mmHg are suggested for cardiac arrest survivors, and volume replacement and vasopressors may be required to keep these values. The most commonly used vasopressor during TH is norepinephrine. Hypothermia causes insulin resistance. Blood glucose monitoring should be performed with venous blood samples as skin vasoconstriction may alter the results. Laboratory tests may be planned every 6 or 12 h, depending on previous results, and include the same tests as during the induction phase. Pulse oximetry is not a reliable parameter during hypothermia, and the mechanical ventilation parameters should be based on arterial blood gas values. Feeding is not indicated during TH, as stomach emptying is tardy in these patients. Moreover, there is an increased mechanical ventilation associated pneumonia (VAP) risk for probable aspiration during cardiac arrest. Strict VAP prevention measures are thus recommended. Hemodynamic instability, with peripheral vasodilation and hypotension is part of post-reperfusion syndrome, and is very common as the temperature increases. It may require higher vasopressor doses. Another concern during rewarming is hyperkalemia, as the potassium cell inflow during hypothermia now flows out. This may cause arrhythmias. All potassium- or magnesium-containing solutions should be discontinued. Insulin infusion is also discontinued due to hypoglycemia risk. There is not enough data about the utility of physical examination, EEG, and evoked potentials in patients who have been treated with induced hypothermia. Physical examination (motor response, pupillary light and corneal reflexes), EEG, somatosensory evoked potential (SSEP), and imaging studies are less reliable for predicting poor outcome in patients treated with hypothermia. Durations of observation greater than 72 h after ROSC should be considered before predicting poor outcome in patients treated with hypothermia (Class I, Level C). With the advent of hypothermia, the current indicators of poor prognosis of neurological outcome need revision. The prognostic ability of median nerve short latency SSEPs does not seem to be affected by TH. Decreasing levels of serum neuron specific enolase (NSE) after TH may indicate selective attenuation of delayed neuronal death in victims of cardiac arrest. Hypothermia is proving to be an extremely robust and important therapy for cardiac arrest survivors and so far the only therapy consistently shown to reduce mortality and improve neurological outcomes in cardiac arrest survivors. Although more research is needed to define optimal timing and duration of therapy, we believe that TH should be initiated rapidly once the indication is clear, particularly among survivors of cardiac arrest. Hospitals must prioritize establishing hypothermia protocols and systems to improve compliance with treatment recommendations which are acceptable, available, and affordable. TH can also be started by paramedics in pre-hospital setting by storing cold IV fluids and ice packs in ambulances, thereby hastening the process of cooling. Individual institutions should choose methods most likely to succeed in their local environment, pending further data comparing the available techniques. Assembly of a TH team and development of treatment protocols are likely to optimize implementation. 1. Varon J, Acosta P. Therapeutic hypothermia: Past, present, and future. Chest 2008;133:1267-74. 2. Benson DW, Spencer FC, Williams GR Jr, Yates AJ. The use of hypothermia after cardiac arrest. Anesth Analg 1959; 38:423-8. 3. Bernard SA, Gray TW, Buist MD, Jones BM, Silvester W, Gutteridge G, et al. Treatment of comatose survivors after out of hospital cardiac arrest with induced hypothermia. N Engl J Med 2002; 346:557-63. 4. Majersik JJ, Silbergleit R, Meurer WJ, Brown DL, Lisabeth LD, Morgenstern LB. Public health impact of full implementation of therapeutic hypothermia after cardiac arrest. Resuscitation 2008;77:189-94. 5. Xiao F. Bench to bedside: Brain edema and cerebral resuscitation: The present and future. Acad Emerg Med 2002;9:933-46. 6. Silbergleit R, Abramson NS. Brain resuscitation. In: Marx JA, et al., editors. 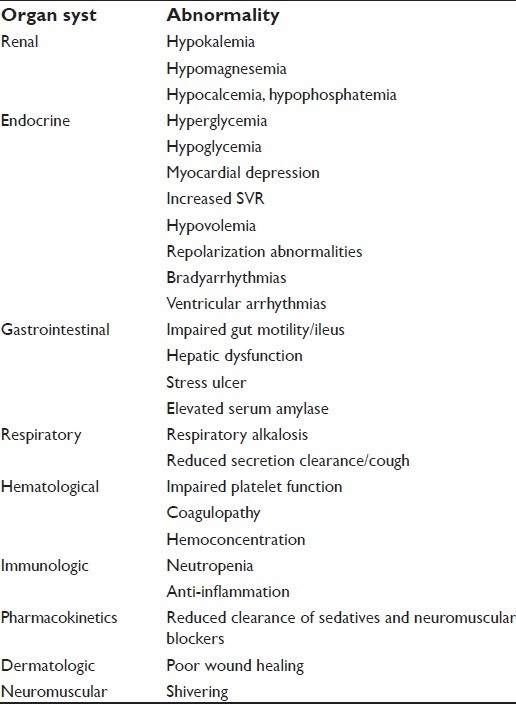 Rosen's Emergency medicine: Concepts and clinical practice. 5 th ed. St. Louis (MO): Mosby; 2002. p. 52-64. 7. Madl C, Holzer M. Brain function after resuscitation from cardiac arrest. Curr Opin Crit Care 2004;10:213-7. 8. White BC, Sullivan JM, De Gracia DJ, O'Neil BJ, Neumar RW, Grossman LI, et al. Brain ischemia and reperfusion: Molecular mechanism of neuronal injury. J Neurol Sci 2000;179:1-33. 9. Vaagenes P, Ginsberg M, Ebmeyer U, Ernster L, Fischer M, Gisvold L, et al. Cerebral resuscitation from cardiac arrest: Pathophysiological mechanisms. Crit Care Med 1996;24;S57-68. 10. Peberdy MA, Callaway CW, Neumar RW, Geocadin RG, Zimmerman JL, Donnino M, et al. Part 9: Post-Cardiac Arrest Care 2010 American Heart Association Guidelines for Cardiopulmonary Resuscitation and Emergency Cardiovascular Care. Circulation 2010;122:5768-86. 11. Rajek A, Greif R, Sessler DI, Baumgardner J, Laciny S, Bastanmehr H. Core cooling by central venous infusion of ice-cold (4 degrees C and 20 degrees C) fluid: Isolation of core and peripheral thermal compartments. Anesthesiology 2000;93:629-37. 12. Haque IU, Latour MC, Zaritsky AL. Pediatric critical care community survey of knowledge and attitudes toward therapeutic hypothermia in comatose children after cardiac arrest. Pediatr Crit Care Med 2006;7:7-14. 13. Hypothermia after Cardiac Arrest Study Group. Mild therapeutic hypothermia to improve the neurologic outcome after cardiac arrest. N Engl J Med 2002;346:549-56. 14. Wright WL, Geocadin RG. Postresuscitative intensive care: Neuroprotective strategies after cardiac arrest. Semin Neurol 2006;26:396-402. 15. Seupaul RA, Wilbur LG. Evidence-based emergency medicine. Does therapeutic hypothermia benefit survivors of cardiac arrest? Ann Emerg Med 2011;58:282-3. 16. Belliard G, Catez E, Charron C, Caille V, Aegerter P, Dubourg O, et al. Efficacy of therapeutic hypothermia after out-of-hospital cardiac arrest due to ventricular fibrillation. Resuscitation 2007;75:252-9. 17. Castrejon S, Cortes M, Salto ML, Benittez LC, Rubio R, Juárez M, et al. Improved prognosis after using mild hypothermia to treat cardiorespiratory arrest due to a cardiac cause: Comparison with a control group. Rev Esp Cardiol 2009;62:733-41. 18. Bernard SA, Jones BM, Horne MK. Clinical trial of induced hypothermia in comatose survivors of out-of-hospital cardiac arrest. Ann Emerg Med 1997;30:146-53. 19. Oddo M, Schaller MD, Feihl F, Ribordy V, Liaudet L. From evidence to clinical practice: Effective implementation of therapeutic hypothermia to improve patient outcome after cardiac arrest. Crit Care Med 2006;34:1865-73. 20. Busch M, Soreide E, Lossius HM, Lexow K, Dickstein K.Rapid implementation of therapeutic hypothermia in comatose out-of-hospital cardiac arrest survivors. Acta Anaesthesiol Scand 2006;50:1277-83. 21. Arrich J. European Resuscitation Council Hypothermia After Cardiac Arrest Registry Study Group. 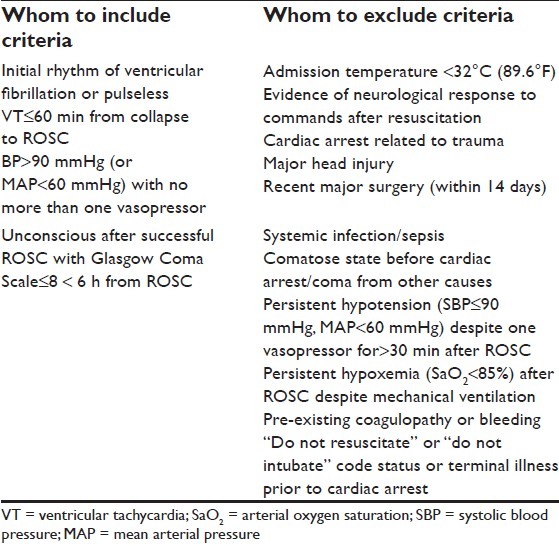 Clinical application of mild therapeutic hypothermia after cardiac arrest. Crit Care Med 2007;35:1041-7. 22. Holzer M, Mullner M, Sterz F, Robak O, Kliegel A, Losert H, et al. Efficacy and safety of endovascular cooling after cardiac arrest: Cohort study and Bayesian approach. Stroke 2006;37:1792-7. 23. Skulec R, Kovarnik T, Dostalova G, Kolar J, Linhart A. Induction of mild hypothermia in cardiac arrest survivors presenting with cardiogenic shock syndrome. Acta Anaesthesiol Scand 2008;52:188-94. 24. Batista LM, Lima FO, Januzzi JL Jr, Donahue V, Snydeman C, Greer DM. Feasibility and safety of combined percutaneous coronary intervention and therapeutic hypothermia following cardiac arrest. Resuscitation 2010;81:398-403. 25. Wolfrum S, Pierau C, Radke PW, Schunkert H, Kurowski V. Mild therapeutic hypothermia in patients after out-of-hospital cardiac arrest due to acute ST-segment elevation myocardial infarction undergoing immediate percutaneous coronary intervention. Crit Care Med 2008;36:1780-6. 26. Knafelj R, Radsel P, Ploj T, Noc M. Primary percutaneous coronary intervention and mild induced hypothermia in comatose survivors of ventricular fibrillation with ST-elevation acute myocardial infarction. Resuscitation 2007;74:227-34. 27. Nielsen N, Hovdenes J, Nilsson F, Rubertsson S, Stammet P, Sunde K, et al. Outcome, timing and adverse events in therapeutic hypothermia after out-of-hospital cardiac arrest. Acta Anaesthesiol Scand 2009;53:926-34. 28. Sunde K, Pytte M, Jacobsen D, Mangschau A, Jensen LP, Smedsrud C, et al. Implementation of a standardised treatment protocol for post resuscitation care after out-of-hospital cardiac arrest. Resuscitation 2007;73:29-39. 29. Voipio V, Kuisma M, Alaspaa A, Manttari M, Rosenberg P. Thrombolytic treatment of acute myocardial infarction after out-of-hospital cardiac arrest. Resuscitation 2001;49:251-8. 30. Weston CF, Avery P. Thrombolysis following pre-hospital cardiopulmonary resuscitation. Int J Cardiol 1992;37:195-8. 31. Kuboyama K, Safar P, Radovsky A, Tisherman SA, Stezoski SW, Alexander H. Delay in cooling negates the beneficial effect of mild resuscitative cerebral hypothermia after cardiac arrest in dogs: A prospective, randomized study. Crit Care Med 1993;21:1348-58. 32. Abella BS, Zhao D, Alvarado J, Hamann K, Vanden Hoek TL, Becker LB. Intra-arrest cooling improves outcomes in a murine cardiac arrest model. Circulation 2004;109:2786-91. 33. Takata K, Takeda Y, Sato T, Nakatsuka H, Yokoyama M, Morita K. Effects of hypothermia for a short period on histologic outcome and extracellular glutamate concentration during and after cardiac arrest in rats. Crit Care Med 2005;33:1340-5. 34. Hicks SD, DeFranco DB, Callaway CW. Hypothermia during reperfusion after asphyxial cardiac arrest improves functional recovery and selectively alters stress-induced protein expression. J Cereb Blood Flow Metab 2000;20:520-30. 35. Colbourne F, Li H, Buchan AM. Indefatigable CA1 sector neuroprotection with mild hypothermia induced 6 hours after severe forebrain ischemia in rats. J Cereb Blood Flow Metab 1999;19:742-9. 36. Neumar RW, Nolan JP, Adrie C, Aibiki M, Berg RA, Böttiger BW, et al. Post-cardiac arrest syndrome: Epidemiology, pathophysiology, treatment, and prognostication. A consensus statement from the International Liaison Committee on Resuscitation (American Heart Association, Australian and New Zealand Council on Resuscitation, European Resuscitation Council, Heart and Stroke Foundation of Canada, Inter American Heart Foundation, Resuscitation Council of Asia, and the Resuscitation Council of Southern Africa); the American Heart Association Emergency Cardiovascular Care Committee; the Council on Cardiovascular Surgery and Anesthesia; the Council on Cardiopulmonary, Perioperative, and Critical Care; the Council on Clinical Cardiology; and the Stroke Council. Circulation 2008;118:2452-83. 37. Gluckman PD, Wyatt JS, Azzopardi D, Ballard R, Edwards AD, Ferriero DM, et al. Selective head cooling with mild systemic hypothermia after neonatal encephalopathy: Multicentrer andomised trial. Lancet 2005;365:663-70. 38. Polderman K, Herold I. Therapeutic hypothermia and controlled normothermia in the intensive care unit: Practical considerations, side effects, and cooling methods. Crit Care Med 2009;37:1101-20. 39. Wolff B, Machill K, Schumacher D, Schulzki I, Werner D. Early achievement of mild therapeutic hypothermia and the neurologic outcome after cardiac arrest. Int J Cardiol 2009;133:223-8. 40. Yenari M, Kitagawa K, Lyden P, Perez-Pinzon M. Metabolic downregulation: A key to successful neuroprotection. Stroke 2008;39:2910-27. 41. Arpino P, Greer D. Practical pharmacologic aspects of therapeutic hypothermia after cardiac arrest. Pharmacotherapy 2008;28:102-11. 42. Bernard S, Buist M. Induced hypothermia in critical care medicine: A review. Critical Care Med 2003;31:2041-51. 43. Polderman KH. Induced hypothermia and fever control for prevention and treatment of neurological injuries. Lancet 2008;371:1955-69. 44. Peterson K, Carson S, Carney N. Hypothermia treatment for traumatic brain injury: A systematic review and meta-analysis. J Neurotrauma 2008;25:62-71. 45. Polderman KH, Callaghan J. Equipment review: Cooling catheters to induce therapeutic hypothermia? Crit Care 2006;10:234. 46. Kliegel A, Losert H, Sterz F, Kliegel M, Holzer M, Uray T, et al. Cold simple intravenous infusions preceding special endovascular cooling for faster induction of mild hypothermia after cardiac arrest--a feasibility study. Resuscitation 2005;64:347-51. 47. Kliegel A, Janata A, Wandaller C, Uray T, Spiel A, Losert H, et al. Cold infusions alone are effective for induction of therapeutic hypothermia but do not keep patients cool after cardiac arrest. Resuscitation 2007;73:46-53. 48. Vanden Hoek TL, Kasza KE, Beiser DG, Abella BS, Franklin JE, Oras JJ, et al. Induced hypothermia by central venous infusion: Saline ice slurry versus chilled saline. Crit Care Med 2004;32:S425-31. 49. Jimmink JJ, Binnekade JM, Paulus F, Mathus-Vliegen EM, Schultz MJ, Vroom MB. The influence of body composition on therapeutic hypothermia: A prospective observational study of patients after cardiac arrest. Crit Care 2008;12:R87. 50. Merchant RM, Abella BS, Peberdy MA, Soar J, Ong ME, Schmidt GA, et al. Therapeutic hypothermia after cardiac arrest: Unintentional overcooling is common using ice packs and conventional cooling blankets. Crit Care Med 2006;34:S490-4. 51. Haugk M, Sterz F, Grassberger M, Uray T, Kliegel A, Janata A, et al. Feasibility and efficacy of a new non-invasive surface cooling device in post-resuscitation intensive care medicine. Resuscitation 2007;75:76-81. 52. Bernard S. Hypothermia after cardiac arrest: Expanding the therapeutic scope. Crit Care Med 2009;37:S227-33. 53. Seder DB, Van der Kloot TE. 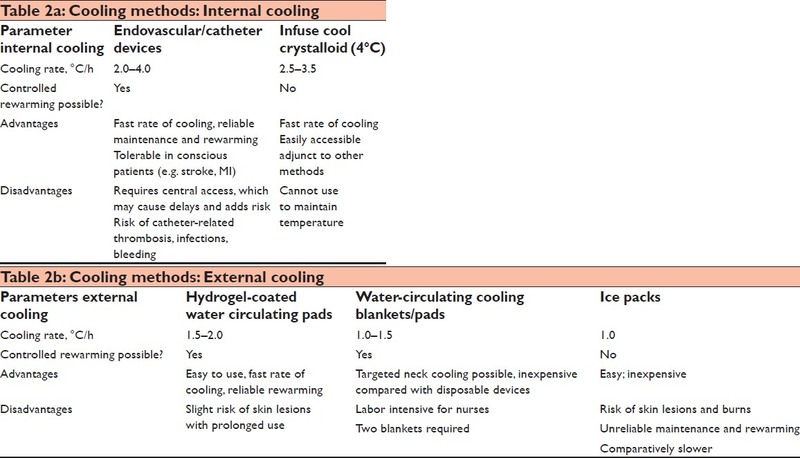 Methods of cooling: Practical aspects of therapeutic temperature management. Crit Care Med 2009;3:S211-22. 54. Takasu A, Saitoh D, Kaneko N, Sakamoto T, Okada Y. Hyperthermia: Is it an ominous sign after cardiac arrest? Resuscitation 2001;49:273-7.